CD2 2016 - 1991 Rare songs, alternative versions, unreleased tracks and old blues. After the stripped-back acoustic nature of It All Comes Round this is a return to the full electric band. No guest musicians, just the “Kokomo sound”. Mike Kirk takes sole electric guitar duties - and proves himself to be a veritable chameleon of tone - while Sonia stretches out on three different horns (all of which feature on “Ruby”). A twentieth anniversary return to Kokomo's roots with a playful all-acoustic mixture of traditional American and contemporary Kiwi blues. Sydney's Queen of Boogie-Woogie Piano, Jan Preston, guests on a song. With Sonia Bullôt unable to play due to illness and to mark the twentieth anniversary of the band, It All Comes Round was a deliberate return to the very early days of Kokomo Blues, collecting new recordings of old blues along with some contemporary Kiwi blues and a couple of songs of Derek's. Musically, it's all acoustic. The title track is a new song while "Bonfires" appeared in a previous version on the band's 1996 collaboration with Tracie de Jong, Stromboling. A long-standing labour of love - the songs of Bob Dylan presented Kokomo-style. Featuring the musical brilliance of multi-instrumentalist Nigel Gavin. Released on May 24th 2008 (Bob's birthday) this project was a long-standing labour of love, with the initial sessions started even before the Kokomo À Gogo CD and DVD were recorded/filmed. It contained the band's most ambitious and colourful arrangements to date, with two particular American special guests adding their unique skills: drummer Matt Hennessey and guitarist/multi-instrumentalist Nigel Gavin. A filmed companion piece to the live CD, this adds an extra 40 minutes of music for a full-length concert film. Concert running time: 101 mins approx. A companion piece to the CD of the same name, this DVD was filmed during two concerts at Baycourt Theatre, Tauranga, New Zealand, November 10th 2005 by Hugh Robb and a specially-assembled team of camera operators. The full-length concert film includes an extra 40 minutes of music not on the CD. The film had two big-screen airings, both at the Rialto Cinema in Tauranga. We welcome enquiries from anyone who would like to arrange a public screening of Kokomo à Gogo. A live showcase of what had become the regular 6-piece touring unit. Featuring one new song and a collection of re-arranged favourites. Recorded live during two concerts at Baycourt Theatre, Tauranga, New Zealand, November 10th 2005. 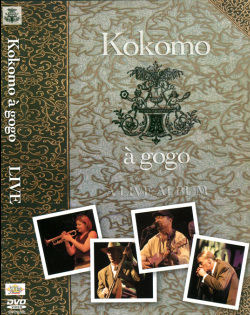 With one new song - "Home of the Blues" – and some radically rearranged takes on others, Kokomo À Gogo is a fine indication of how the regular six-piece line-up had settled in and, at the time, was the best representation of the “Kokomo sound” to be captured on a recording. A collection of new songs recorded live in the studio to capture the band's natural sound. With Sonia Bullôt now a permanent member of the band this was a return to basics, recorded largely live in the studio with only minimal input from outside players. In a last gasp of analogue pride, no computers were used in the recording and mixing of the album. It took bloody forever. A 500-CD signed and numbered limited edition 10th anniversary collection of alternative versions, rarities and a handful of new recordings. Long sold out, contact the band to arrange a CD-R on demand. Released at the end of 2001 in a signed and numbered limited edition of 500 copies, this was not intended as any particular sort of “Best of Kokomo”, but rather a way to mark our 10th anniversary by cleaning out the vaults. Blues And Beyond is a mixture of some new recordings, some alternative versions, and a few bits ‘n’ bobs that got lost along the way. Three songs are from the now-unavailable Stromboling collaboration with Tracie de Jong, two are from an obscure Bay Of Plenty compilation, Picture This, and one (“Nowhere To Go”) was commissioned for a short film that never got made. Others are either different versions from the official releases or new recordings. A collection of original songs, advancing from the original "Kokomo Blues" acoustic trio with additional instruments ranging from electric guitar, trumpet, and saxophone to massed crystal glasses. Nigel Masters became Kokomo's bass player in 1998 and a year later Kokomo returned to The Boatshed Studio for the band's most ambitious album yet, for the first time broadening the sound palette with a range of other instruments. This was the first time Sonia Trappitt (later to become Sonia Bullôt) recorded with the band. To mark the departure of founding bass player Roger Bullôt from the band, the name was shortened from Kokomo Blues to simply Kokomo.